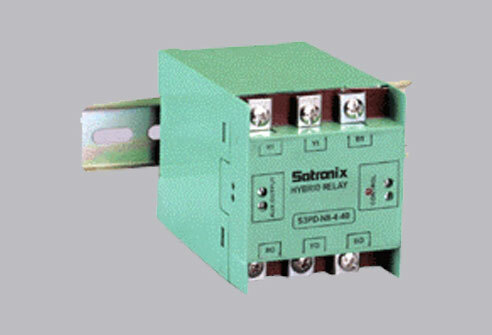 is a Non-Heat 3-phase Solid State Relay. It helps to clip inrush currents generated due to transients that are a result of high power load switching. It is also called hybrid relay. A hybrid SSR is built using advantages of electromechanical relay and Solid state relay while avoiding their limitations. The SSR switching (ON and OFF) occurs at zero cross over. There is virtually no contact arcing hence no wear and tear issues. Mechanical contact carries load current hence power dissipation is low. After a minimum delay of 30 ms the load will be switched off. The power outputs will be off max 100ms after the input control voltage has been removed. Established in 1985 Satronix is one of the leading manufacturers of Factory Automation components and Power Electronics products in India for the last 30 years. Our mission is to provide High Quality, Cutting Edge, Cost-Effective products and Robust automation solutions to our customers.